Wood Talk No. 108 Double Matt! 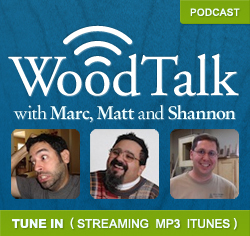 The latest episode of Wood Talk is now available, head over to www.WoodTalkShow.com to checkout the latest shownotes and download the show. In episode No. 108 we’re joined by Scott Meek of Scott Meek Woodworks, www.scottmeekwoodworks.com. Scott is an amazing wooden bodied handplane maker and is back from his successful first year at Woodworking in America as a vendor. Also on today’s show we’re talking about cold weather woodworking and we have a very special event for you: the Matt2007 vs Matt2012 SawStop debate. That’s right folks, I’m going back in time and debating myself on the merits of the SawStop tablesaw. Don’t forget to visit our Wood Talk sponsor MicroJig. Don’t miss out on the latest news and happenings at MicroJig by signing up for the MicroJig Newsletter.